Announced by Playtonic Games (Tuesday, February 10, 2015)! 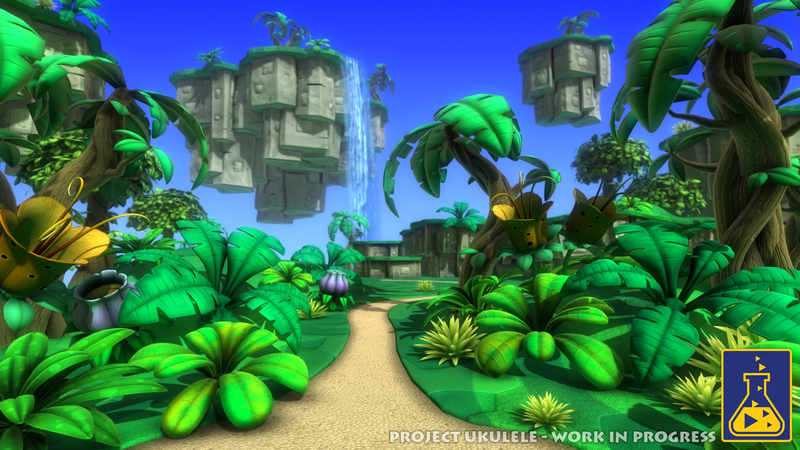 The spiritual successor to Banjo-Kazooie! Will come to all platforms, including Wii U. Release: October 2016 (Worldwide). They're a bunch of Ex-Rare developers. They're making this game for PC, and have said it's possible they could work with Nintendo to have this game in the Wii U. If it's any good, I'd love to see it on the Wii U.
I missed out in Banjo-Kazooie myself, so hopefully it would be similar. They've been bringing in several more Ex-Rare people lately, so it's looking good right now. Yeah, they just brought in Wise, Kirkhope, and Burke for the soundtracks. Banjo-Kazooe back in the day were great games. I loved the platforming and collecting objects, like notes and jiggies. Hopefully they can make a deal with Nintendo to have this game on the Wii U.
Luma Party, you definitely missed out back then. Those Banjo games were stellar titles to play. I'm hoping Nintendo finally goes through with putting N64 games on Wii U Virtual Console. They released the original Banjo Kazooie on the Wii VC, so hopefully I could finally get a chance to play it. No, they never released Banjo-Kazooie for the Wii Virtual Console. Banjo-Kazooie was a game made by Rare, and Microsoft owns Rare. Rare owns the Banjo-Kazooie IP. Banjo-Kazooie and Banjo-Tooie will never be released for the Virtual Console as long as Rare owns the IP, which Microsoft owns the company, as well. You can get a digital version of Banjo Kazooie and Banjo Tooie on the Xbox 360 though. Either that or it was DKC they released and they talked about Banjo Kazooie possibly releasing. 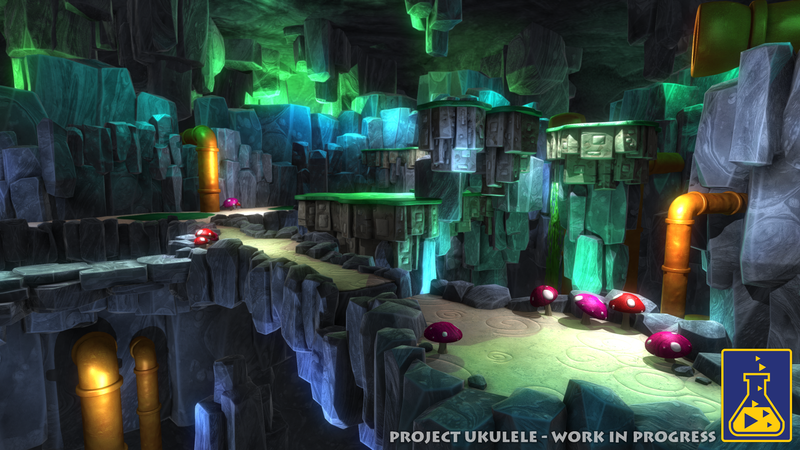 Playtonic will be presenting info about Project Ukulele at EGX Rezzed. Not exactly sure what "Rezzed" is but at least they're presenting something. 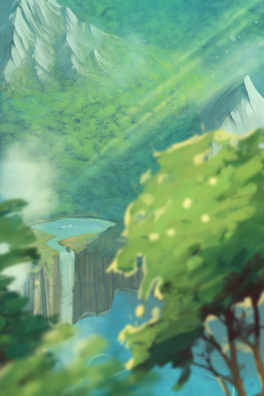 Here's some concept art from the EDGE Issue they were featured in. Nice. 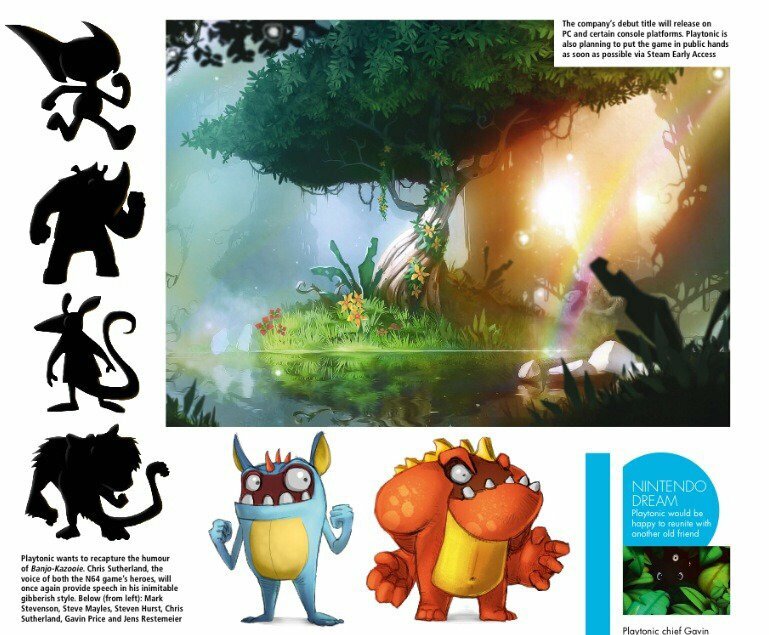 That hidden character (second from top) looks like Banjo, only bigger and a nose that seems to be that of a rhino. Discussion by GameXplain about this. Pretty interesting actually. They say the project will still continue even if Kickstarter fails. kickstarter and video games have a bad relationship. This guy is codenamed "Keith the Minion" and will fight the heroes at some point.